The Finance Minister has set aside Rs 75,000 crore for the scheme. 2% interest subvention for farmers pursuing animal husbandry and fisheries through Kisaan credit cards. A separate Department for fisheries would be created. Budget announced setting up of Rashtriya Kamdhenu Aayog to upscale sustainable genetic upgradation of cow resources and to enhance production and productivity of cows. It is aimed at doubling agricultural exports and integrating Indian farmers and agricultural products with the global value chains. Its vision is to harness export potential of Indian agriculture, through suitable policy instruments and to make India global power in agriculture and raise farmers’ income. Double agricultural exports from present US$ 30+ Billion to US$ 60+ Billion by 2022 and reach US$ 100 Billion in next few years thereafter with stable trade policy regime. Diversify India’s export basket, destinations and also boost high value and value added agricultural exports including perishables. Provide institutional mechanism for pursuing market access, tackling barriers and deal with sanitary and phyto-sanitary issues. Strive to double India’s share in world agri-exports by integrating with global value chain at earliest. Promote indigenous, organic, ethnic, traditional and non-traditional agri products exports. Enable farmers to benefit from export opportunities in overseas market. Indian agriculture is characterised by low scale and low productivity. About 85% of the operational landholdings in the country are below 5 acres and 67% farm households survive on an average landholding of one acre. More than 50% of area under cultivation does not have access to irrigation. Agriculture income generated is not adequate to meet farmers’ needs. The share of institutional loans disbursed to agriculture and allied sectors has risen from 9% in 2000-01 to 31.4% in 2015-16. The amount of short-term institutional loans for agriculture exceeds the total cost of inputs including hired labour. This indicates that a part of crop loans is spent on non-agricultural purposes. According to NSS surveys on Investment and Debt (NSS-I&D), loans taken by cultivators from non-institutional sources is rising faster than from institutional sources. Much of the growth in household demand in rural India has been debt-ridden and not supported by growth in income. Modern agriculture requires investment in farm machinery and inputs like seed, fertiliser, agri-chemicals, diesel and hired labour. Savings generated from unremunerative crop enterprise are inadequate for such investments. Rising expenses on health, education, social ceremonies and non-food items put additional financial demand on farm families. States like Uttar Pradesh, Maharashtra, Punjab and Karnataka have rolled out farm loan waiver schemes for immediate relief to farmers. The demand for such measures is spreading to other States too. Ultimate goal is to lessen the debt burden of distressed and vulnerable farmers and help them qualify for fresh loans. The success of the loan waiver lies on the extent to which the benefits reach the needy farmers. It covers only a tiny fraction of farmers. According to 2012-13 NSS-SAS, 48% of the agricultural households did not have any outstanding loan. Out of the indebted agricultural households, about 39% borrowed only from non-institutional sources. 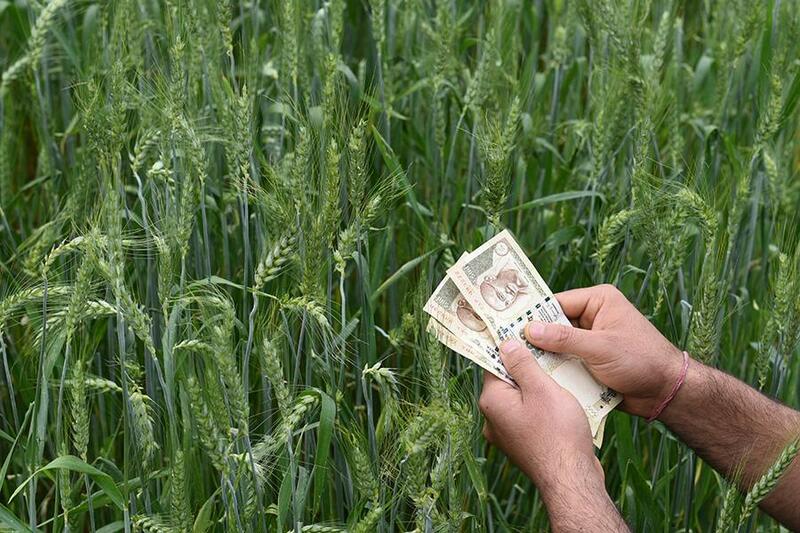 The farmers investing from their own savings and borrowing from non-institutional sources are equally vulnerable, but are outside the purview of loan waiver. Provides only a partial relief because half of the institutional borrowing of a cultivator is for non-farm purposes. Many household has multiple loans either from different sources or in the name of different family members, which entitles it to multiple loan waiving. Loan waiving excludes agricultural labourers who are weaker than cultivators in bearing the economic distress. It severely erodes the credit culture, with dire long-run consequences to the banking business. Scheme is prone to serious exclusion and inclusion errors, as evidenced by the Comptroller and Auditor General’s findings in the Agricultural Debt Waiver and Debt Relief Scheme, 2008. According to the CAG report, 13.46% of the accounts, eligible for the benefits under the scheme were not considered by the lending institutes while preparing the list of eligible farmers. In 8.5% of the cases, the beneficiaries were not eligible for either debt waiver or debt relief but were granted the benefits. Around 28% of the beneficiaries were not issued debt relief certificates which would have entitled them to fresh loans. Implications for other developmental expenditure, having a much larger multiplier effect on the economy. A similar amount spent on improvement of agriculture infrastructure and other developmental activities would create a base for future growth and development of the sector. It has a meagre chance of bringing farmers out of the vicious cycle of indebtedness. There is no concrete evidence on reduction in agrarian distress following the first spell of all-India farm loan waiver in 2008. More inclusive alternative approach is to identify the vulnerable farmers based on certain criteria and give an equal amount as financial relief to the vulnerable and distressed families. Strengthen the repayment capacity of the farmers by improving and stabilising their income. Improved technology, expansion of irrigation coverage, and crop diversification towards high-value crops are appropriate measures for raising productivity and farmers’ income. 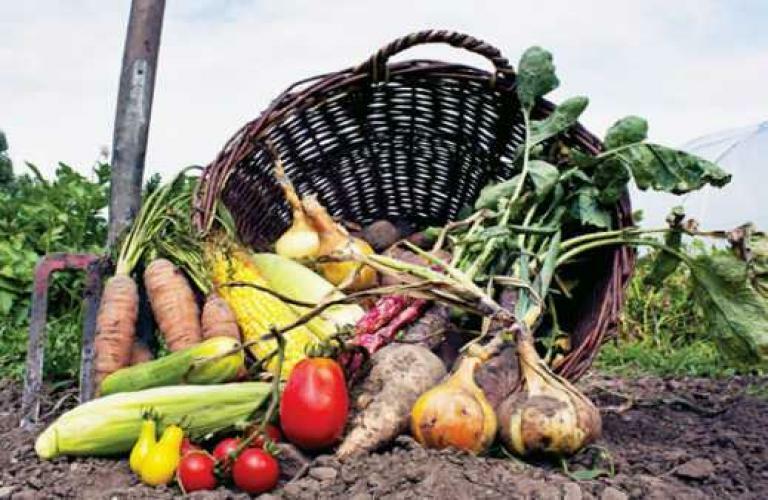 Another major source of increase in farmers’ income is remunerative prices for farm produce. Removal of old regulations and restrictions on agriculture to enable creation of a liberalised environment for investment, trading and marketing. States must undertake and sincerely implement long-pending reforms in the agriculture sector with urgency. Given by Indian Council of Food and Agriculture. The ICFA’s World Agricultural Prize carries a cash component of $1,00,000 and will recognise individuals who have served humanity through agriculture. It will be an annual prize and would be presented to any individual or institution, importantly from Asian, African or Latin American countries who have played a seminal role in transforming agriculture globally and saving humanity from the curse of hunger. 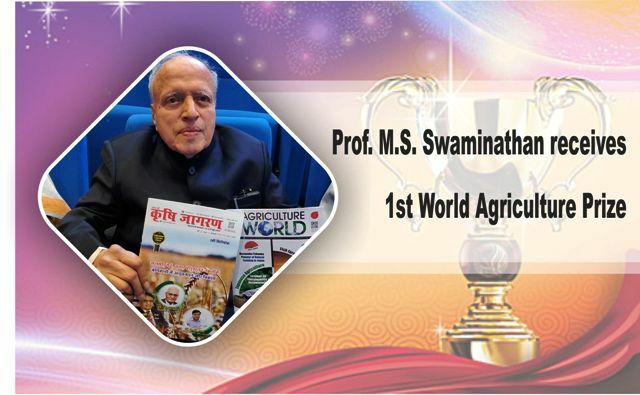 Prof. Swaminathan is known as Father of Green Revolution in India and is renowned worldwide for his basic and applied research in genetics, cytogenetics, radiation and chemical mutagenesis, food and biodiversity conservation. 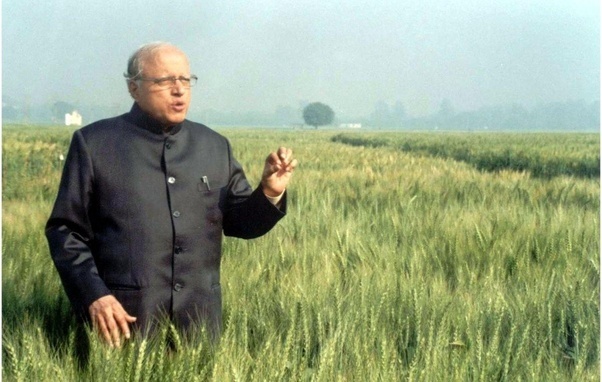 The United Nations Environment Programme has hailed him as ‘The Father of Economic Ecology’ owing to his commitment towards the ever-green revolution movement in agriculture. Fishing in India is an important economic activity and emerging sector. 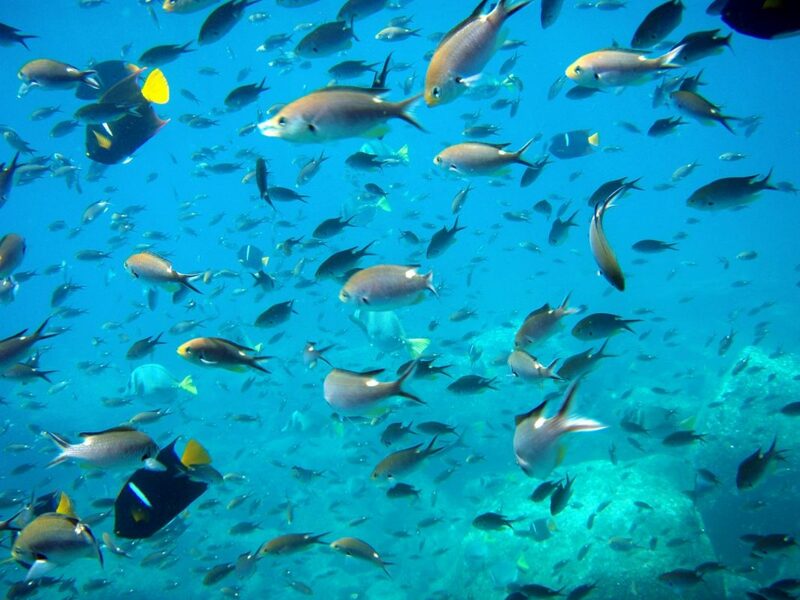 India’s fish production is estimated at around 12 million tonnes annually. India has become the second largest fish producing and aquaculture industry in the world. In aquaculture, India is second to china with a share of 6% in global aquaculture. The fisheries sector employed over 14.5 million people directly and many more indirectly. At present, Fish production contributes to around 1% to GDP of country and 5% to agricultural GDP of country. India exports one tenth of its Fish produced. The contribution of fish from the seas has lowered now and the share is rising from inland farming. improving the manpower requirements of the fisheries programs. Government has established a fund named FAIDF to boost fishing. Overall, fisheries is a sunrise sector having a lot of future growth possibilities. All the 3 sub sectors viz. Inland, Aquaculture and Marine fisheries have a lot of scope for improvement. The recent step of creating FAIDF is a praised step to boost the fisheries sector to the desired level. Sikkim is first organic state in the world and all farmlands in the state are certified organic. State’s policy approach reaches beyond organic production and has proven transformational for its citizens. It primarily focuses socioeconomic aspects such as consumption and market expansion, cultural aspects as well as health, education, rural development and sustainable tourism. The organic farming policy implemented by state has phased out chemical fertilisers and pesticides, and achieved total ban on sale and use of chemical pesticides in the state. The transition has benefitted more than 66000 farming families in state. Transition to 100% organic state also has greatly benefited its tourism sector and numbers of tourists have increased by over 50% between 2014 and 2017. With this Sikkim has set excellent example for other Indian states and countries worldwide for successfully upscale agroecology. Sikkim was awarded UN Food and Agriculture Organisation’s (FAO) Future Policy Gold Award (Gold Prize) for its achievement in becoming the world’s first totally organic agriculture state. India is 6th largest coffee producer in the world with 4% share after Brazil, Vietnam, Colombia, Indonesia and Ethiopia. In India, coffee is cultivated in about 4.54 lakh hectares by 3.66 lakh coffee farmers and 98% of them are small farmers. Karnataka (54%), Kerala (19%) and Tamil Nadu (8%) are largest coffee producing states. India accounts for only 4-5% of world’s coffee output, but exports 70-80% of its produce. Italy, Russia and Germany are the top three buyers of Indian coffee. In India, two coffee varieties robusta (or Coffea canephora) and Coffea arabica are grown on large scale. Millet is common term to categorize small-seeded grasses that are often termed nutri-cereals or dryland-cereals. It mainly includes sorghum, ragi, pearl millet, small millet, proso millet, foxtail millet, barnyard millet, kodo millet etc. They are adapted to harsh environment of semi-arid tropics. They require low or no purchased inputs, thus they are backbone for dry land agriculture. Millets are nutritionally superior to wheat and rice owing to their higher levels of protein with more balanced amino acid profile, crude fibre and minerals such as Iron, Zinc, and Phosphorous. It provides nutritional security and act as shield against nutritional deficiency, especially among children and women. 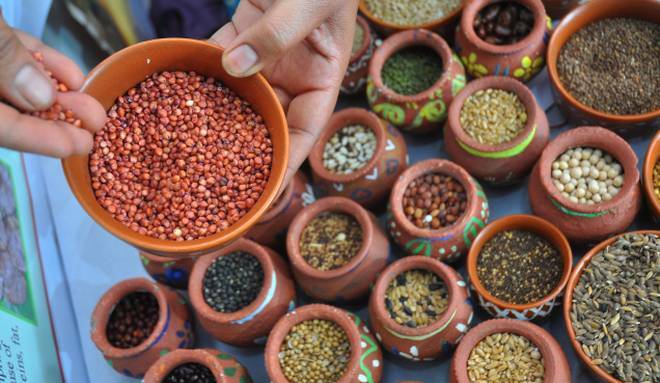 Pellagra (niacin deficiency), Anaemia (iron deficiency), B-complex vitamin deficiency can be effectively tackled with intake of less expensive but nutritionally rich food grains like millets. It can also help tackle health challenges such as obesity, diabetes and lifestyle problems as they are gluten free and also have low glycemic index and are high in dietary fibre and antioxidants. Millets are important staple cereal crop for millions of small holder dryland farmers. They offer nutrition, resilience, income and livelihood for farmers even in difficult times. They have multiple untapped uses such as food, feed, fodder, biofuels and brewing. Thus, millets are Smart Food as they are Good for the Farmer and Good for Planet. Millets are photo-insensitive and resilient to climate change. They are hardy, resilient crops that have low carbon and water footprint. They can withstand high temperatures and grow on poor soils with little or no external inputs. In times of climate change they are often last crop standing and thus are good risk management strategy for resource-poor marginal farmers.